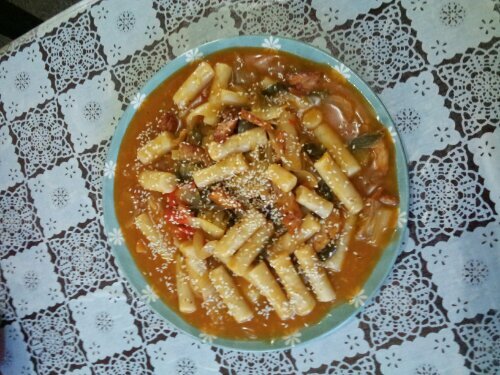 Its a beautiful and hot saturday…i was bored so ive decided to make tteokbokki from scratch..its actually my 2nd time making this. The 1st time, my tteok was a major failed! Hahaha..
Making tteok is a little tricky actually even its only using rice flour, salt and water ( 3 cup of rice flour, pinch of salt and 1 and half cup of water ). Mix it all until u have a grainy/lump mixture. Make sure the lump is not too big so that it will cook nicely. Flatten evenly on a cotton cloth then steam for about 20 minute. While tteok still hot/warm… Mash it up till u have nice texture some kind of plastesin texture..ive spent about 20 minutes to mashed the tteok..haha..tiring but ull see the different…last step is to roll the tteok wit ur bare hand till u have ur desire shape… If its sticky to shape, wet ur hands wit a water that mix with a little bit of oil. Move on to the sauce! Its not really like a 100% of its ingredients.lol. Im just following my tastebud to have the same experience as i tasted tteokbokki in a restaurant a while ago. 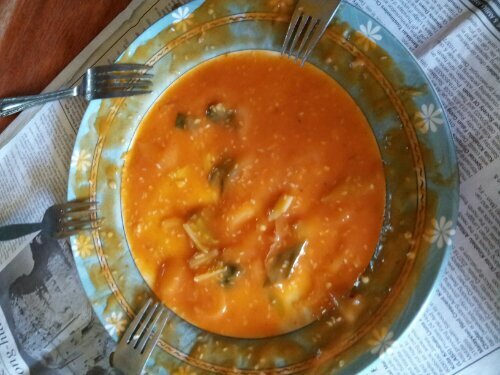 On a boil water add all ingredient (sesame seed on the last stage) together with the tteok…stir and let it simmer until u have a nice and thick sauce. Add sesame seed and a final stir. Posted in F & B, korean food. Bookmark the permalink.